In the year 2004 the author became fascinated with a sport: The Aggressive Rollerblading. While teaching Acting at the TAI, Beatriz wrote and directed a 19 characters play: “Rollerblading”. The play involved stunts, flying characters, big screens and aggressive rollerblading live, it end up being so big that it had to be staged in an unconventional space. 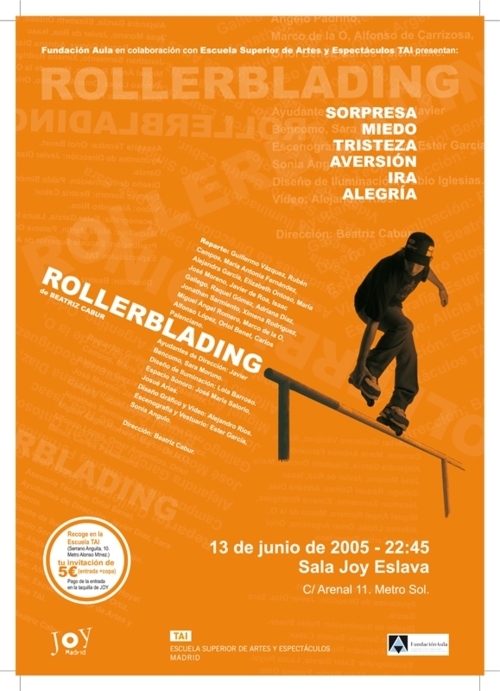 “Rollerblading” premiered in Joy Eslava, in Madrid, on June 13th, 2005. “Rollerblading” is about achievements, it is about effort, love, desire and friendship, it is about evolving and working hard, about the private companies trying to acquire personal values and discovering that everybody has their price. It is about becoming the best version of yourself and about realizing how hard it is. How lonely you will be when you are on top of the world. How far the top of the world is from any other place, so far that perhaps you won’t ever be able to come back.